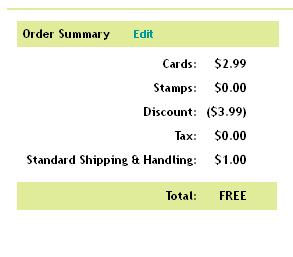 DEAL #1: Today at Cardstore.com you can get a FREE custom card with FREE shipping with code CSTHANKS112 at checkout. I clicked my way over to Cardstore.com and fell in love with this graphic and an idea was born. PROJECT #1: I decided to get this card for myself as a little piece of art I’ll frame and hang in a prominent place to remind me of my goals for 2012. Inside I included a quick-and-dirty summary of my 2012 goals. And just in case, here’s a little proof that this is 100% free… GO GET ONE!!! 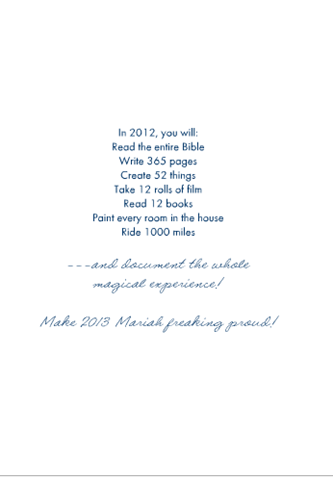 So what have you got going for 2012? Resolving not to resolve? Is this the year you conquer the world? Let’s hear it!